New Release: Big Happy Jig! We’re starting 2019 off with a BIG bang! Introducing the new BIG HAPPY JIG! Custom wire designs just got a little larger. The Big Happy Jig by We R Memory Keepers is the perfect tool for creating personalized, colorful party and home decor projects. Simply choose a design, lock the pegs into place according to the booklet, and follow the directions to wrap wire around the pegs into the desired shape. And with new neon wire, your custom creations will light up any room! The Big Happy Jig starts shipping to retailers mid-January, so watch for it in stores and online sometime in February! Hello, and Happy Friday friends! Next week we head into 2019 and I’m so excited to start the new year! I’m looking forward to some awesome opportunities and setting some goals. Getting organized, planning and setting goals works a lot better for me if I have them written down so I can keep myself accountable and on task. Each year I make a printable calendar to help me do that, so today I’m sharing a FREE PRINTABLE planner that you can use for 2019. The cool thing about this printable calendar is that you can start it any time and you can use it for any year. It’s also pretty versatile, so you can make one for each month, or you can create one for the entire year. Take a look! To create my planner I used my FREE PRINTABLE 2019 PLANNER which you can download below, some papers and embellishments from the Dear Lizzy New Day collection, some stickers from the Amy Tangerine Journal Studio collection, and some We R Journal Studio tools. Then I trimmed the pages (they each have a trimming guide) and folded them in half. I ordered them so that page 1 is on top and page 7 (the single page) is on the bottom, repeating this order for each month’s pages. Then I trimmed a patterned paper divider for each month from the New Day collection. Trim the dividers to 6 1/2 inches wide and 5 5/8 inches tall to match the printed pages. Place all the folded pages in your signature face up on the left side of the tool. There’s a groove in the base of the tool which makes is easy to accurately place your pages. Place the piercing guide on top of your papers with the groove side facing down. Turn the screws to secure the guide, making sure the holes with the rings around them are centered along the fold of the pages. Use the piercing tools to pierce every other hole (the ones with the rings). Make sure the tool pierces through all the pages. Repeat these steps for all twelve signatures. Use the straight needle and the wax thread to saddle stitch each signature (instructions included in the manual). Thread the needle with a single strand of thread. Thread the needle through the hole at one end of the pages, going from the inside to the outside of the signature (inside pages to outer cover), leaving 3-4 inches at the end to tie a knot once you finish stitching. Go up through the next hole, down through the next hole, up through the next, etc. until you reach the end. Then stitch back to the other end using the opposite motion (stitch up through the down holes and down through the up holes). Repeat this all the way to the other end so that you have continuous stitches on the inside and outside of your signature. Tie the two ends in a square knot and trim the excess. 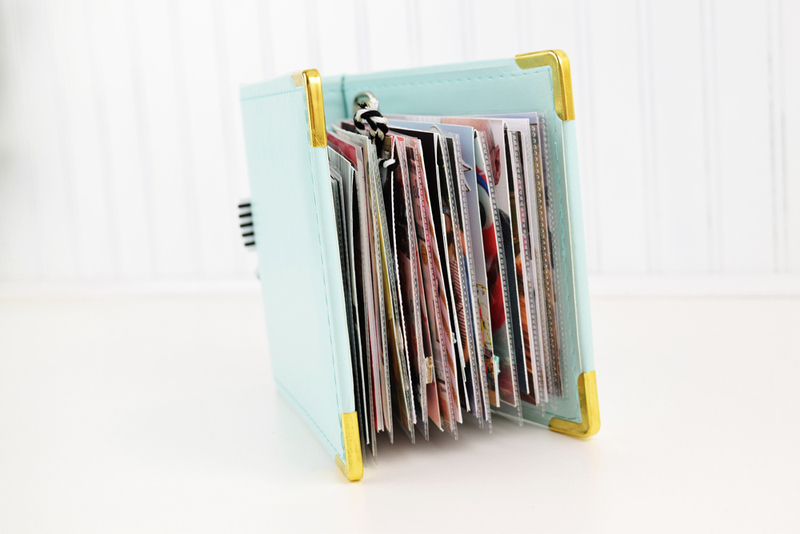 Saddle stitch all twelve of your signatures together, and then your ready to make your covers! I trimmed two pieces of book board to 3 1/2 inches wide and 5 3/4 inches long. 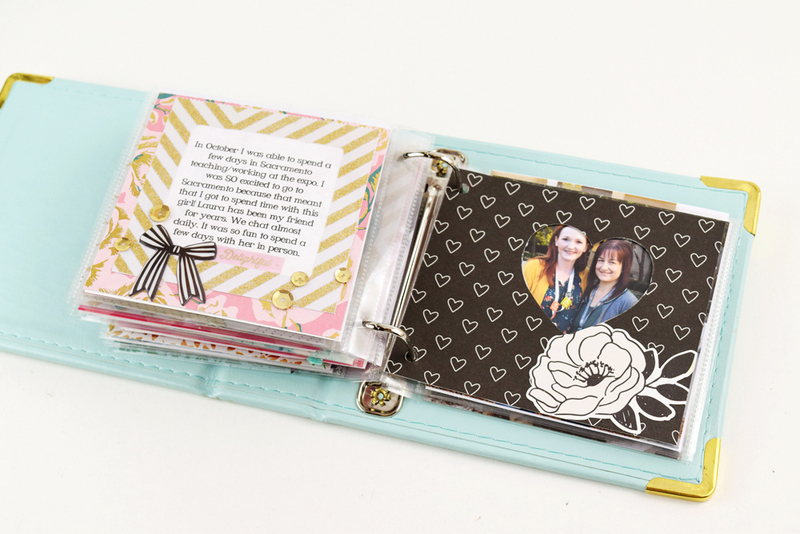 I covered them with patterned paper from the New Day collection and then pierced holes in both cover. The holes for the covers must match the holes for the signatures. When piercing covers, place them on the left side of the Book Binding Guide and flip the piercing guide over so that the flat side is facing down. Use the center column of holes and align the ringed holes to they’re centered like the holes for the signatures were (see above photo for details). Then tighten the screws to hold the piercing guide in place. Pierce through every other hole (all the ringed ones) with the piercing tool. Repeat these steps for the other cover. Now it’s time to bind together the covers and the twelve signatures! You can find instructions in your Book Binding manual, more details and photos in THIS POST by Eva Pizarro, and you can also watch this helpful video tutorial. Use the curved needle and wax thread. Thread the needle and tie a knot in the end of the thread. Start by stitching together the bottom cover and the last signature (December pages) following the instructions in the booklet. Add the November signature using the instructions, and then continue adding all the signatures in reverse order through February. If you’d like you can add sequins to the coptic stitches to embellish your book. Finish off the book with the January signature and the top cover. Tie the loose end in a square knot and trim the excess. I added a pom pom tassel from the New Day collection, attaching it to the binding stitches on the outside of the planner. Tip: I used multiple strands of thread (about four) since it’s easier to stitch smaller lengths of thread. Just be sure to finish a length at the end of a signature, and start a new length at the beginning of a signature. 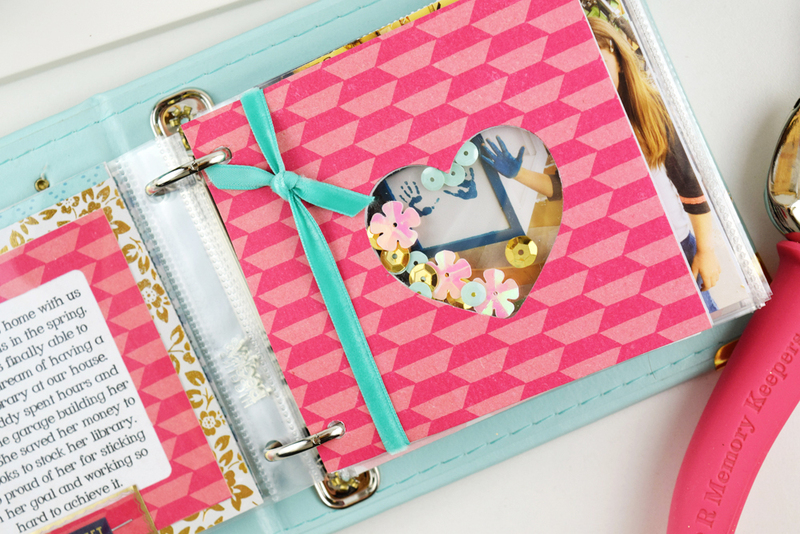 Once you’ve finished binding your planner, you can decorate the inside pages! I like to use flat embellishments (stickers, rub ons, washi tape, ephemera, stencils) so I don’t add too much bulk to the book. 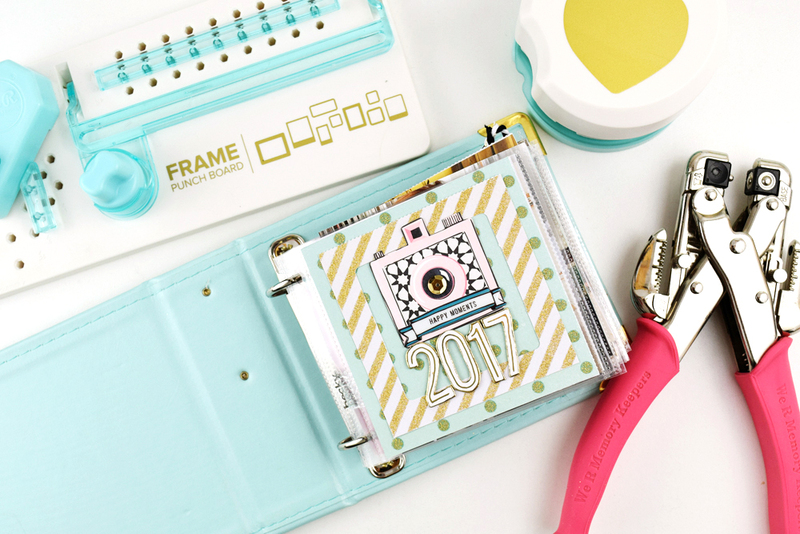 Since this planner can be used for any year and can start at any time, you’ll need to add the dates. 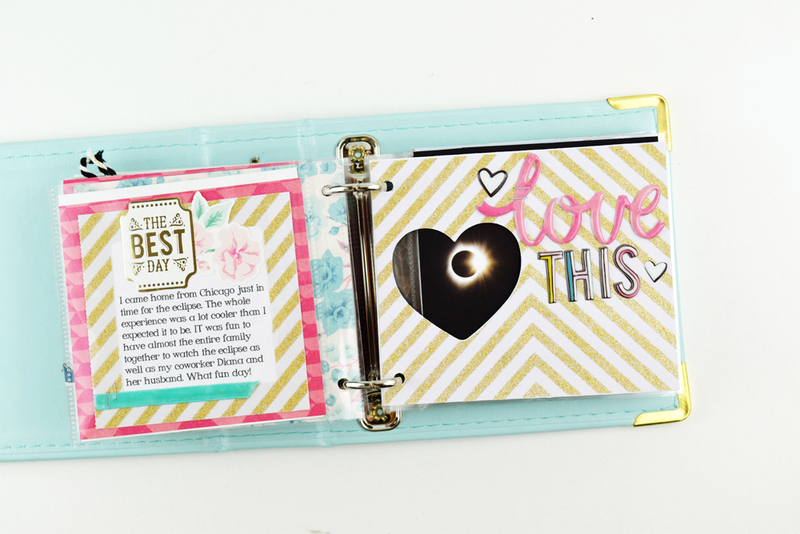 You can write them, stamp them, or use stickers from the Journal Studio. I used my colored pencils. 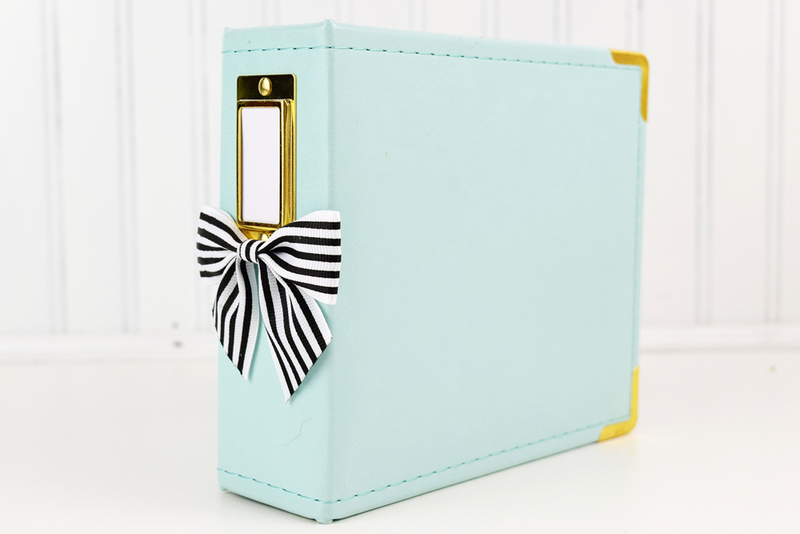 Decorate your front cover with stickers, washi tape, rub ons or ephemera. I used the Dear Lizzy New Day and Amy Tangerine Journal Studio collections. This would be a fun weekend craft project to get ready for the new year next week. Thanks for stopping by! Have a fun and crafty weekend friends. Hello there! It’s Rebecca with you for my last post of 2018! It’s so hard to believe that the year will be over in just a few short days, isn’t it? As I’ve been buried in the hustle, bustle, and tinsel of the holiday season, I’ve also been giving a little bit of thought to 2019 and what I’d like to do with a brand-new year. Of course, there are the obligatory goals—exercise more, eat healthier, get more sleep, drink more water, etc. I also always give a thought to what I’d like to accomplish as a creator. In today’s post, I’ll give you a peek at my goal tracker and show you some of the We R Memory Keepers Journal Studio tools I used to help me stay focused. I’m excited to finally take my graphic design up a notch with ProCreate for the iPad Pro. There are many creative areas I’d like to further develop—sketching, hand lettering, water coloring, just to name a few. My list was getting pretty long, and I began to think I was taking on far too much. But when I really started to think about it, I realized that many of the techniques I’d like to learn or improve could be accomplished by tackling ProCreate. With my list not sounding as daunting now, I set out to figure a way to track my progress. I really wanted a way to stay accountable and focused, while keeping track of what I was learning. I pulled out a May Designs journal which has grid pages, as well as a perpetual week in review. I could make my tracker on one of the 2-page grid spreads and use the weekly calendar to track progress. I turned first to the WRMK All In One Journal Tool, using several of its features on the 2-page grid spread. My idea was to track the entire year of practice, so I used the top part of the guide to create 12-month tracker. I made 3 circles and 12 straight lines to divide the large circle into 12 parts. Those serve as January through December, and go in a monthly order, with January at the top. I then drew 3 horizontal lines in each month’s column, which gave me 4 long rectangles; they represent 4 weeks per month. Underneath the circle tracker, I’ve created my color key. I used the Journal Tool again to make this, utilizing the 3-lined stencils and 3-circle markers. I color-coded each circle to represent how many days per week I’ll practice ProCreate. It’s possible I’ll allow myself weekend breaks, though I’ve included the 6-7 days/wk option in case I change my mind. I’m looking to form productive habits with this, too, and practicing every day is the best way to establish those. When I finish the week, I’ll fill in the grid with the corresponding color. (I’m keeping daily track on the weekly spread, which I’ll share later in the post.) I’ve filled in December as an example, though I haven’t actually been keeping very good track of my practice, as it’s been few and far between this month! I’ve made some notes about where to find inspiration and resources in case I get stuck. Both the “Find Inspiration” banner, as well as the half-box were made with the Journal Tool, and similar drawings are on the facing page, as well. Speaking of the facing page, I used the Magnetic Alphabet and Symbol Stencils to trace 2019 CREATE onto the top of my page. I covered the words with some opaque washi tape to add some color to the pages and used a few darker strips for the same purpose. I included some of the illustration hashtags I like on Instagram, which will be another resource throughout the year. I’ve left extra space in that box, as well as in the inspiration box, because I’ll likely find more of both in the future. Lastly, I want to keep a list of all the art and design skills I hope daily practice in ProCreate will help to improve. While I won’t be tracking those individually, I’d still like to keep them in mind in order to stay accountable to them. Here’s a quick look at my week-at-a-glance, as well. I’ve kept it simple, filling in the dates for the first week of January, and on each day, indicating a space for both the number of minutes I practiced, as well as the particular skill I worked on. On the opposite page, I used the Alphabet Stencils again to write THIS WEEK IN PRO CREATE. I created a box to write notes, tips, or thoughts with the All-in-One Journal Tool, and I’ve got a spot to write down the total minutes and days practiced. This page set up is subject to change, depending on what I want to write down each week. I may also decide to track the week with a similar circular tracker, as well; it remains to be seen. I’m excited to begin, and excited to (hopefully) watch my improvement! It’s also nice to have a notebook exclusively devoted to this goal so it’s easier to stay focused. A couple other things I wanted to mention are the Travel Workspace and Washi Spool Keychain you’ll see in the photos. They’re a couple of handy tools that, even though I’m not traveling far (mostly from my desk to my couch or dining room table! ), these hold the necessary utensils so I can work on this anywhere. It’s got a nice hard surface on which to write, and plenty of pockets. The Washi Spool clips onto it, and the outside is soft felt so it’s gentle when I’m carrying it with my iPad. It doesn’t get handier than that! Wishing you all a very Happy (and productive) New Year! Hello We R fans! Soraya here today to share a decor inspiration for the New Year Eve party! Let’s make big tassels and pop it up with hot pink letters! The Tassel Loom is the perfect tool to create tassels (small, medium or large size) in a very easy way! I made several of them using pink and black/silver yarn. The color combo is girly and festive in a same time! With a silver washi tape, I’ve decorated the top of each tassell. I love the bright detail it brings to them! For the banner, I used the Alphabet Punch Board and a hot pink cardstock. I followed the instructions in the guide book to create the “Happy New Year” banner. And for the small papers (3×5 inches) I used my Trim & Score Board to easily cut them all. And voilà ! All you have to do now, is to add embellishments, ribbons… sequins, silver stars… and party with your family and friends! I hope you had fun joining me for this inspiration. Happy creating everyone and have a wonderful end of the year! Hello We R fans! Kimberly here today with a sweet (literally) party favor for your upcoming New Year’s Eve celebrations. It’s a busy time of year during the holidays, but when we host a gathering, we still want to have those handmade, extra-special touches. This project is going to check all those boxes for you! Easy, thoughtful, and fun! The We R Memory Keepers Emoji Punch Board is going to bring out the smiles in everyone! The time-honored tradition of kissing your love at midnight can stay alive and well (and cootie free) with these adorable kisses, with a kissy face. Using the Emoji Punch Board and the pre-cut paper pad, I made these kissy faces quickly! The faces are almost the exact same size as the candy, so they fit perfectly on the bottom with a small amount of adhesive. Beginning with the heart eyes, I followed the instructions on the punch board. To create the heart eyes, I placed my paper on the side labeled “eyes” on the punch board. I flipped my paper over and punched the second eye. I followed that with the mouth, and then the final punch of the circle shape. These are so cute, I may need to make more for Valentine’s Day! To help explain to the guests what the treat is, I created a card of sorts. Using the Word Punch Board, I created paper strips saying “kiss me at midnight.” Behind the letters, I layered glitter cardstock to bring some shine to the project. I also added a couple of glitter kissy faces to the card as well. Fast and fun and sure to be memorable as well! Who will you be “kissing” at midnight this year?